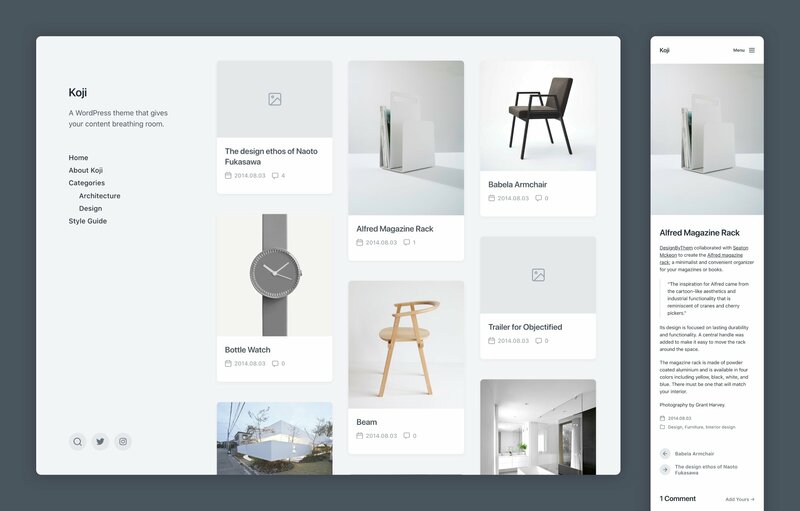 The latest addition to my library of free WordPress themes is Koji, a clean and lightweight blog theme that displays your posts in a Pinterest-like masonry grid. Koji actually went live on the WordPress theme directory earlier this week – just a couple of days after a submitted it. I got caught off guard by the fast review and approval (special thanks to theme reviewer acosmin! ), and I didn’t even have time to get up a demo installation and a theme page and demo installation before it went live. That’s a nice problem to have. They’re up now, though. You can find the theme page here, and the demo installation here. Koji should look pretty familiar. Structurally, it’s more or less identical to Fukasawa, a theme I released more than four years ago (ran the math on that twice, just to make sure). It has a sidebar with the site title, description and main menu on the left, and the site content on the right, arranged in a masonry grid on archive pages. Yes, it’s “one of those” themes, but I think it’s a pretty good one. Koji includes a couple of features that I hope will help it to stand out a bit. It features three different pagination settings: Load more posts when a ”Load more” button is clicked, load more posts when the visitor reaches the bottom of the page (aka infinite scroll), and the traditional Older posts/Newer posts links. The ”Load more” button pagination is default, and the user can switch freely between them in the Customizer. One of the most common support requests I get for my themes is how to either add or hide a particular type of post meta from the archives pages or single posts. People with a single author on the site don’t want to display the author name, and people who use it as a portfolio might not want to show post dates. Koji solves this by including a Customizer setting that allows users to select what post meta to display on archive pages and on single posts, so they can adjust the post meta as they see fit. Koji is available as a free download from WordPress.org, or through Appearance → Themes → Add New in your WordPress administration panel. I hope you’ll like it. On a related note: This week, WordPress announced that the planned release date for WordPress 5.0, which includes the new Gutenberg editor, is November 19. I’m still planning on updating all of my themes before Gutenberg is released, even if the November 19 release date holds. It’s going to be tight, but it’s doable.